Springtime this year has been chilly, cold, damp, and wet. These pics with the dark and moody images remind me of the feeling of spring. The mornings are dark and dreary, but by the mid-afternoon, there is this beautiful sunlight that kisses your face and warms you like a big hug. These Muffins have been an epic hit at our house. I love using spelt flour as a substitute for wheat. I find that it is easier to digest and has a higher nutritional value, especially when you use sprouted spelt, like in this recipe. I find spelt flour is very comparable to wheat flour in taste. If you have never tried spelt this is a great recipe to get your toes wet as all my family and extended family love these muffins. They are rich, moist and the spices in these beauties really pack a wonderful flavour combination. What are the nutrients in sprouted spelt flour? This particular sprouted spelt flour is from Anita’s Organic Mill. Per 1/2 cup it has 10 grams of fiber, which will make your intestines happy! It is also loaded with plant protein 8 grams per 1/2 cup. The fiber and protein combination will help keep blood sugars balanced, unlike those sugary muffins from Tim Hortons. I have always loved carrot cake and I feel like this recipe is a healthier version of the traditional carrot cake. There is only a small amount of oil as the applesauce replaces most of it. I added in some dates to cut down the amount of sugar, but still keeping the sweetness of carrot cake. I also love the spiciness of this muffin. Allspice is one of my favorite spices. I love the beautiful undertones of nutmeg, cinnamon, and cloves. The joy of this recipe is when they are in your oven your house smell amazing! I could just bake these for the natural house air freshener, lol. So now for this recipe! I hope you enjoy making these beautiful muffins and bask in how delicious your kitchen is going to smell after making them. Remember to always eat with love. That is the most important key to digestion. Preheat oven to 350F and grease muffin tray. If using the parchment muffin wraps like I used no grease is needed. Mix flour, baking soda, baking powder, spices, and coconut sugar together. Form a well with the dry ingredients and set aside. Mix the wet ingredients with a whisk. Add the wet ingredients into the well. Mix just to incorporate ingredients and then fold in your carrots, nuts, and dates. Don't over mix. 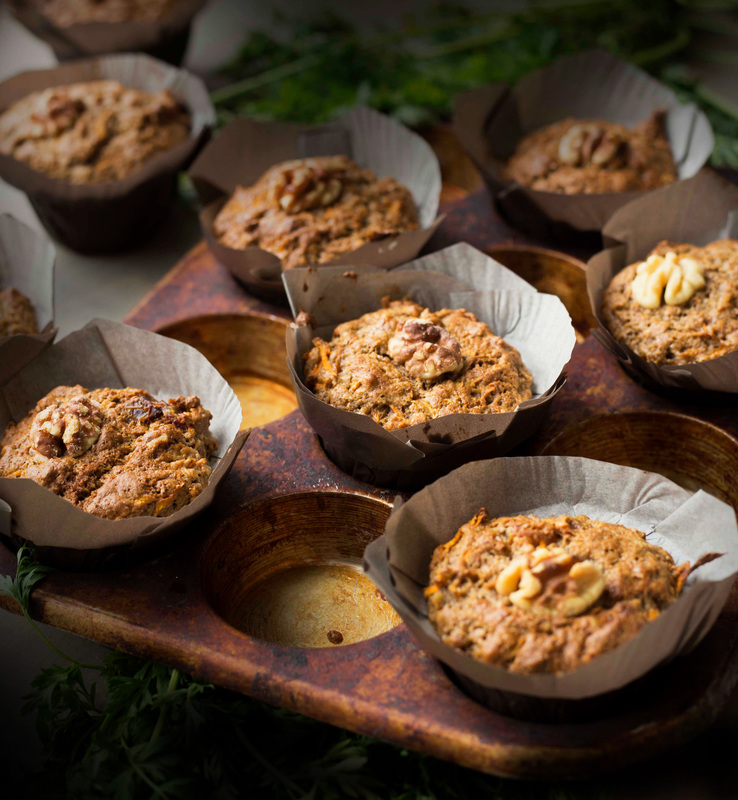 Put into greased muffin tin or parchment wraps and top with one walnut for decoration. For the large overside muffins bake for 23 mins. For the regular sized muffins, bake for 18 mins. Check with a toothpick once it comes out clean they are done. Most importantly eat with love.